In south-west France, it’s not just the bread that’s rising. Sick of the regulation stifling commercial trade in historic grains, peasant farmers are doing it for themselves. Chef Pamela Brunton sorts the wheat from the chaff. ‘Non,’ says Eric the baker. He doesn’t believe that growing his wheat here, a crust’s toss from the Pyrenees, makes any difference to the quality of his bread. Moi, I disagree. In the French wine trade, terroir denotes the special characteristics that a place – geography, geology and climate – can bestow on a wine. The ‘peasant resistance’ currently challenging the regulatory stranglehold on the commercial seed trade in France seems to recognise the importance of having diversity in your seeds. The belief is that it’s better for grains to complement the special characteristics of the land where they are grown, including the local weather, and the tastes of the people who farm and eat there. Grand cru baguettes, anyone? In September 2010, I spent a week working on Eric Marie’s twenty hectare organic farm, where he and his partner Nicole Perrin grow thirty two varieties of ancient and heritage grains in what their entry on the World Wide Opportunities on Organic Farms (WWOOF) website calls ‘an experimental population wheat platform.’ Eric mills the flour himself and makes bread twice a week to sell in three local markets. The farm is in the départment of the Haute-Pyrenees, near the town of Castelnau. The local village of Monleon-Magnoac, population barely into double figures, boasts one bar, an electric guitar store and an arthouse cinema. The land here is flat, but the Pyrenees are strewn in the distance like broken bread on a windowsill, hunks torn from the risen horizon. Eric and Nicole are members of the Réseau Semences Paysannes, or Peasant Seed Network. The network was set up in 2003 to counter the ‘stifling’ legislation surrounding the registration of commercially traded seeds’ and to, ‘encourage peasant farmers not to hide,’ providing a forum for exchanging seeds and knowledge. The network helps to protect biodiversity and improve resilience in local wheat farming. It gives a voice (and conversation) to small-scale farmers all over France. Et alors, the seeds themselves. The couple grow indigenous varieties of wheat, including the local blé des Hautes Pyrénnée’1 and historic grains like la touselle, first recorded in 1042, when it was described as ‘the finest and purest wheat… without beard or whiskers.’ They also grow and bake with petit épeautre, an ancient form of wheat (Triticum monococcum), which was harvested from the wild as early as 16,000 BC and domesticated around 10,000 BC. Known in Britain as einkorn (literally, single grain), it’s significantly higher in protein than modern wheat, extremely high in vitamin B and magnesium, and very low in gluten. It thrives in poor soil and is resistant to disease and pests because of the strong glumes (husks) that tightly enclose the grain. Unfortunately, it yields far less than modern wheat crops, which is why it has been largely abandoned for commercial production, except in small areas in Provence, Italy and Yugoslavia. 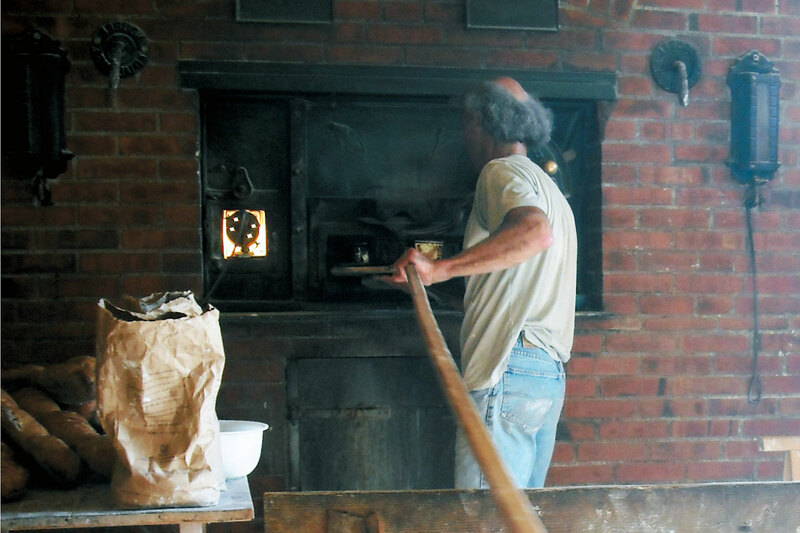 Twice a week, Eric rises early to bake fifteen types of bread in his antique wood-fired oven in the lean-to barn beside his house, using natural levain and a peel as long as a tractor pass. He favours little kneading, producing chewy, densely-textured baguettes, pain de campagne, pain complet (wholemeal), raisin and honey, sunflower, walnut, rye, and spelt loaves that convey the tastes of the grain above all. Then at the end of the day, Nicole hijacks the oven for tartes made from myrtilles, dark wild members of the blue/bilberry family, from the nearby hills. Twice a week, Eric rises even earlier and packs his pick-up and Nicole’s car with bread for the two local markets, plus the locals who wait for him en route. His customers are loyal and happily provide lively anecdotes describing how traditionally made bread has helped soothe troubled stomachs. Whether it’s the variety of wheat itself that helps, or the way it’s cultivated, or the methods used to prepare the bread, without the addition of chemicals, the loaves seem able to subdue the symptoms of gluten intolerance. So is it time that heritage wheat and bread were granted the same protection as champagne, or an appellation d’origine contrôlée similar to that enjoyed by Bordeaux reds? Though perhaps it’s the farmers themselves who need to be protected from rules created to control seeds that, without having passed the test of history, are ill-equipped to resist the problems food and farming face today. There is wisdom buried in ancient grain, like fossils in peat; given the chance bakers like Eric could secure us all a more grounded future. 1. The other varieties, which I couldn’t translate but which might mean something to somebody out there, included, “le Galer ou Sarragnet, la touselle qui vient de l’Herault ; la bladette de Puylaurens du département du Tarn; Hermès,le blé de Redon (Bretagne), and le rouge de Bordeaux - okay, I know the last one: ‘Bordeaux Red’.